Part 2 gave some ideas for women who have breastfed in the past but are no longer nursing a child. 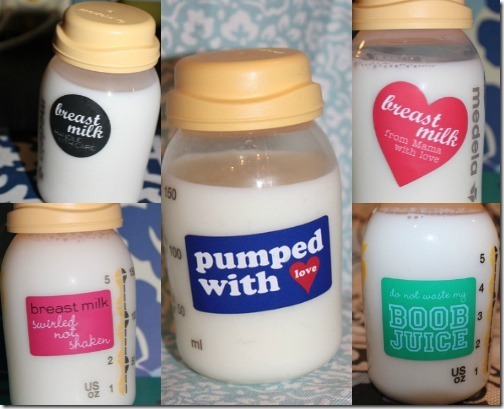 Part 3 is for exclusive pumpers – those of us who pump our breast milk and feed it to our babies by bottle either by necessity or by choice. Bohden’s Best sells these awesome stickers to decorate your bottles and such. They do NOT come off in the wash and there are lots of different kinds. Do you keep your pumping quiet, maybe because you are upset that nursing at the breast didn’t work out? Don’t let that get you down, you are doing a GREAT job and you are providing your baby with breast milk! 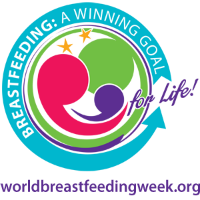 Celebrate your pumping milestones with an award or just announce it to family and friends what you have accomplished. Write a letter to your little one explaining your feelings surrounding his or her birth and how you came to be an exclusive pumper. Share the sad feelings you might have but also share the great feelings you have now. Share some stories of your child as a baby, especially a newborn. Tuck the letter away somewhere safe (like a safe!) and hold on to it till your baby is an adult. Then when you feel the time is right, share the letter with your child. A baby moon is a term that is like a honeymoon but for parents to be or new parents. A vacation where you just either enjoy being pregnant just before the baby is born or you enjoy the first few weeks. I suggest you take a pumping baby moon where you and baby and any significant other you might have, take a vacation together and just stay in and pump and feed and spend time together. No worries about going out sight seeing and needing to pump or entertaining visitors. Find fun things to do together in your hotel room and spend lots of skin to skin cuddle time with the baby and each other. I bet it will even increase your supply!